Second, to use VISSIM microsimulation to test the impacts of various operational improvement strategies on the speed and running times of Route 104 buses. 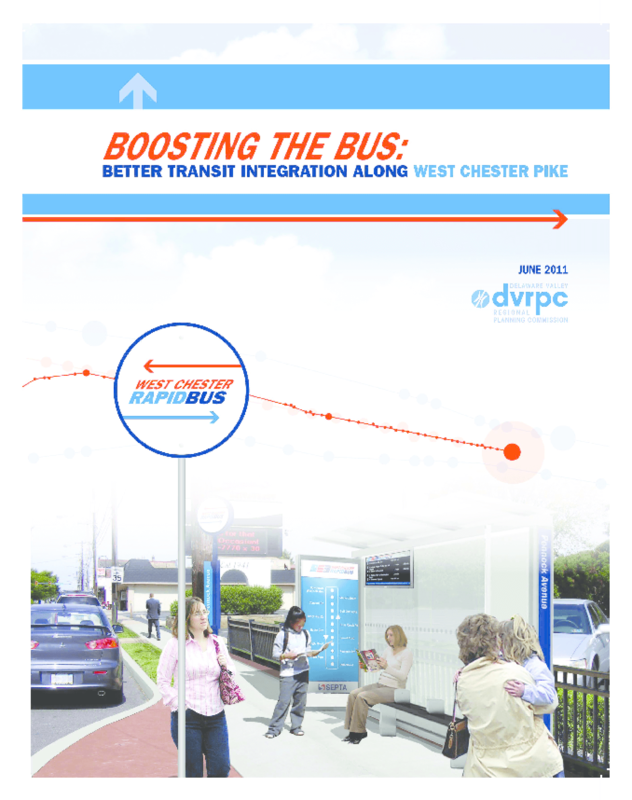 This project draws on the findings of several prior efforts by the Delaware Valley Regional Planning Commission (DVRPC) and its planning partners for enhancements to transit service in the West Chester Pike (PA-3) corridor. These include a 2007 DVRPC feasibility study for a dedicated median busway between 69th Street Transportation Center and I-476 (Feasibility Analysis of West Chester Pike Busway, pub. no. 07001) as well as a Transportation Management Association of Chester County (TMACC) study from the same year that considered the feasibility of Transit Signal Priority (TSP) in the Chester County portion of the corridor (Transit Advantage: Transit Signal Priority on PA Route 3). Drawing on the generally favorable findings of the latter study, DVRPC's 2008 Speeding Up SEPTA report (pub. no. 08066) included a case study on SEPTA Route 104 in a chapter that addressed strategies to improve the effectiveness of suburban bus service. Following stakeholder discussions, staff developed a series of three enhancement scenarios for Route 104: a) a corridor-length implementation of TSP; b) TSP plus a relocation of many nearside stops to the far side of their intersections; and c) TSP plus a new limited-stop operating pattern (the West Chester RapidBus). DVRPC's simulations of these enhancement scenarios suggest that they would result in travel time savings, with the most meaningful benefits naturally being observed under the RapidBus proposal (which was simulated to cut the time competitiveness gap between auto and transit by about 32 percent in the westbound direction, and 66 percent eastbound). The time savings estimated for the TSP-only and TSP plus far-side stop scenarios are much more modest, with only a negligible additional benefit being observed for the addition of far-side stops to TSP. For West Chester Pike, the next steps toward improving bus service are to pursue implementation strategies (either incrementally or as a single project). The Delaware County TMA (DCTMA) is presently managing a feasibility and outreach project on implementing TSP and land use access improvements, which are expected to be consistent with the recommendations of this report. The experiences of other cities and regions that have pursued bus enhancement or Bus Rapid Transit (BRT)-lite projects like the proposed RapidBus, from major cities to suburban corridors, suggest that when it comes to the effectiveness of improvements, perception is reality. Whichever improvement strategies are pursued -- from simple TSP to the full RapidBus vision - they should be promoted and branded rather than made quietly.